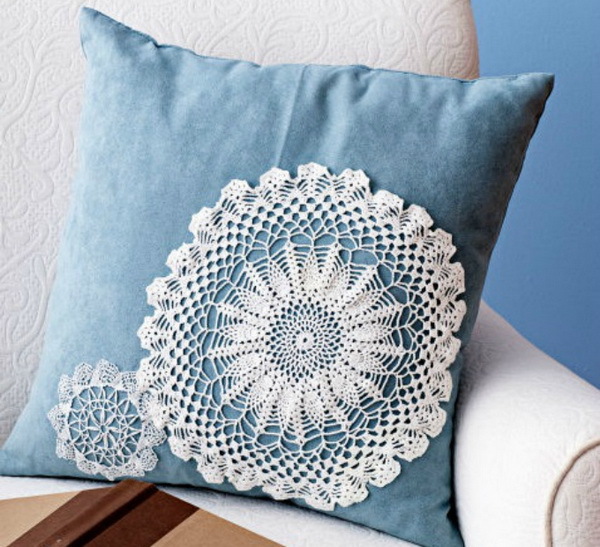 Almost everyone’s home has doilies lying around, either sitting on table surfaces, or stuffed into the pantry. They are usually used as decorations for plates of food, and save wood or glass surfaces from scratching and help to prevent sliding. 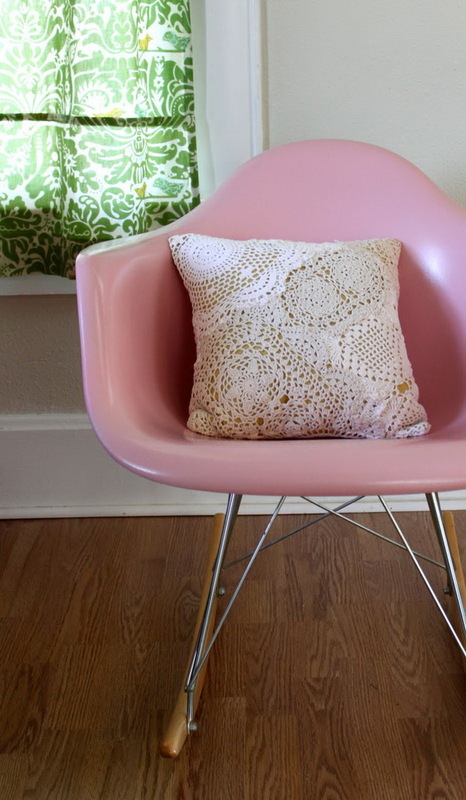 But do you know doilies can also be used in many DIY projects? 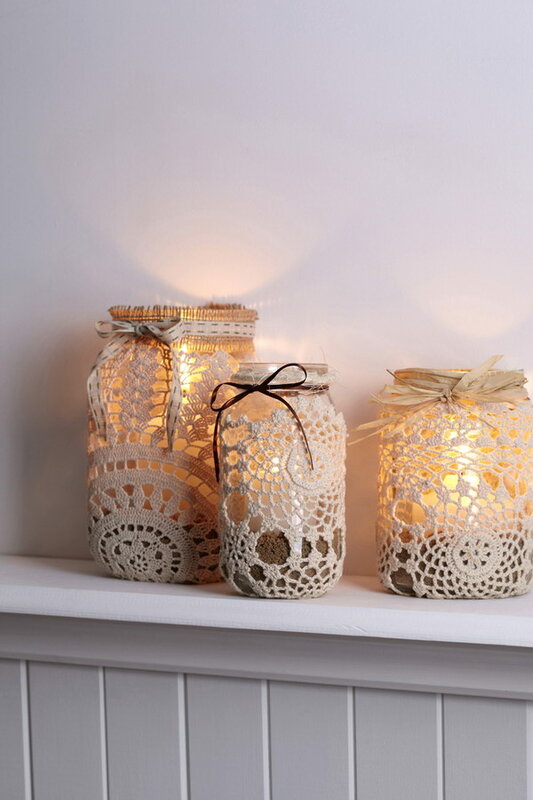 Wrap a clear glass mason jar with a beautiful paper doily for a vase and put the spring flowers in, use doilies to make romantic bags for wedding favors and baby shower gifts, or create a doily covered lampshade and give your bedroom a fantastic shabby chic style. 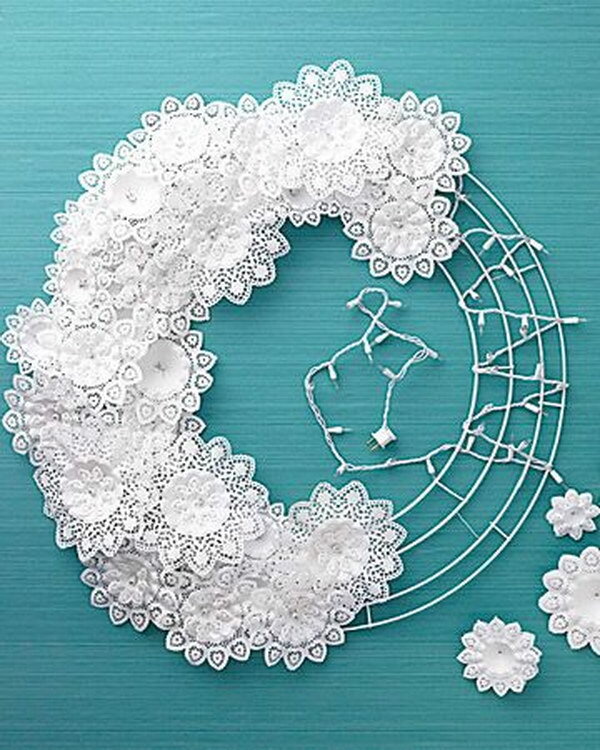 There are so many different options when it comes to create doily crafts. 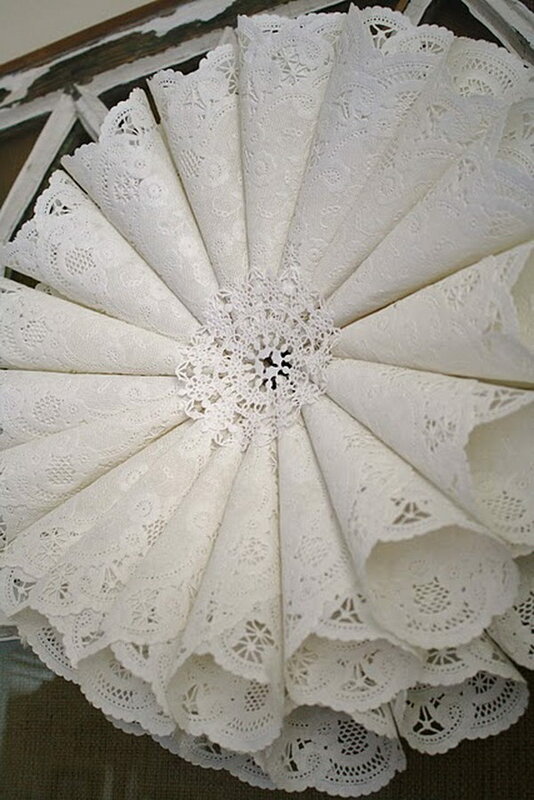 Check out these beautiful DIY fabric and paper doily crafts. 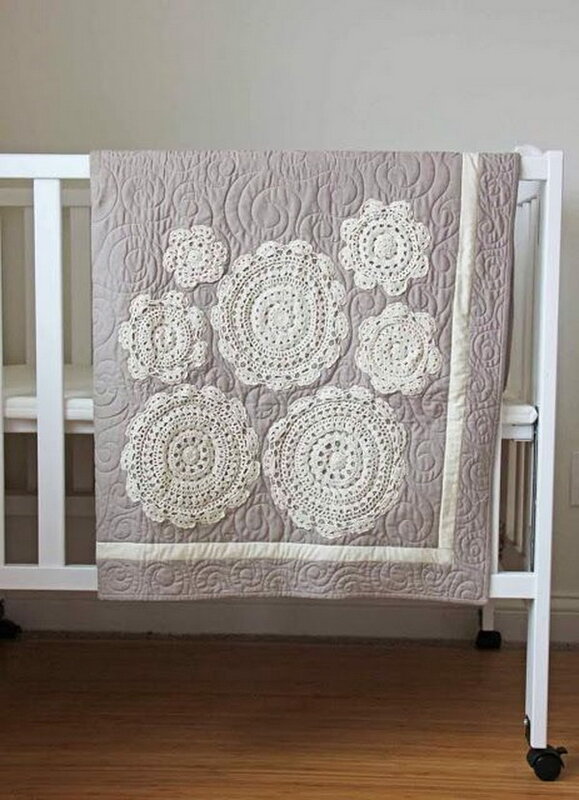 These clever uses of doilies open up doors of possibilities! 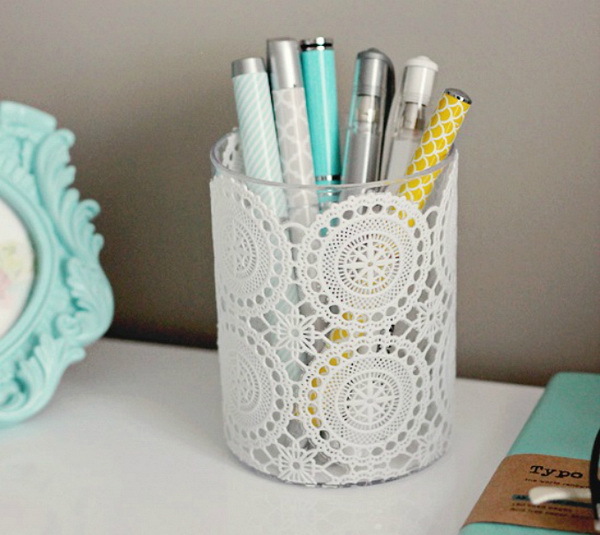 Learn how to make this super easy lace doily bowl. All we needed was a lace doily, glue and glass bowls. Tutorial via freepeople. Love this awesome easy and cheap centerpiece! 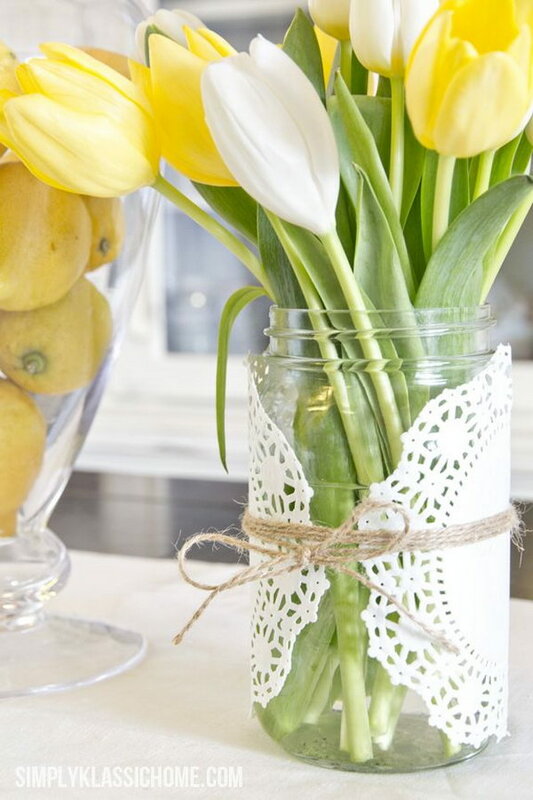 Wrap a clear glass mason jar with a beautiful paper doily for a vase and put the spring flowers in. Tutorial via yellowblissroad. The genius woman made her own lace doily wedding dress. Head over to the story via giacanali. 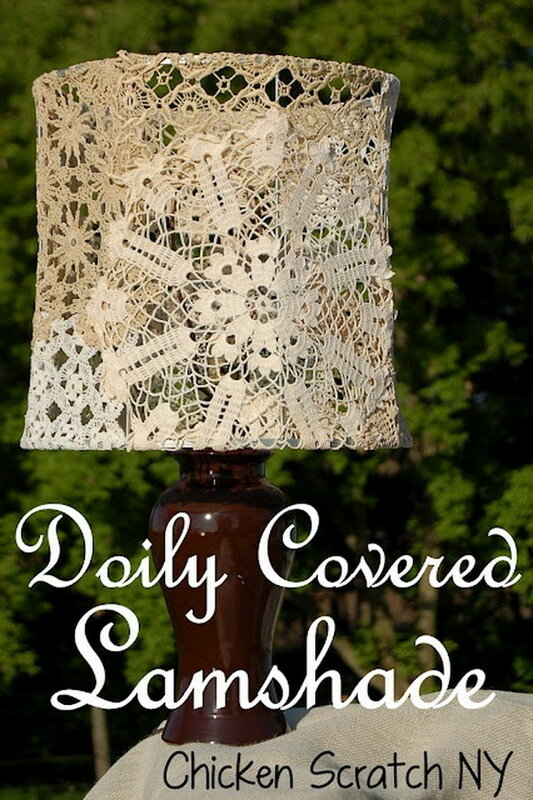 The lace gives the lamp a fantastic shabby chic style. Perfect for a girl’s bedroom. Get the tutorial via chickenscratchny. 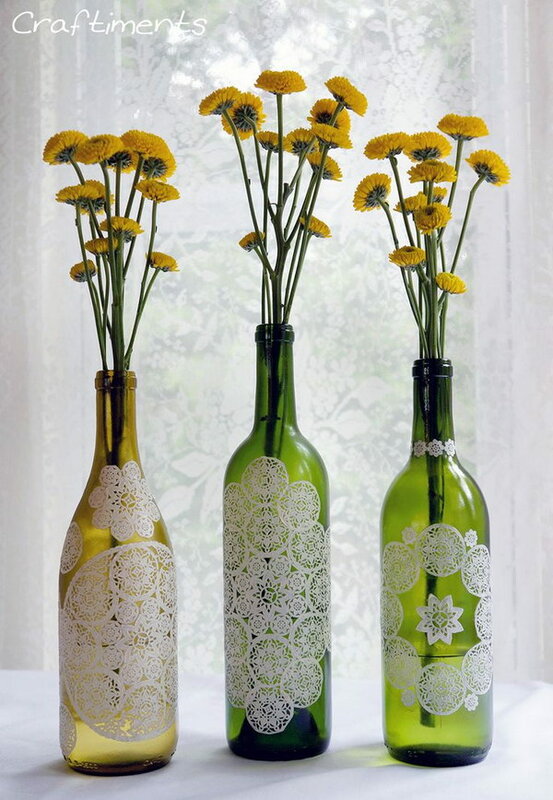 Make beautiful holiday centerpiece from stunning vases using wine bottles, paper doilies, and white glue. Tutorial via craftiments. 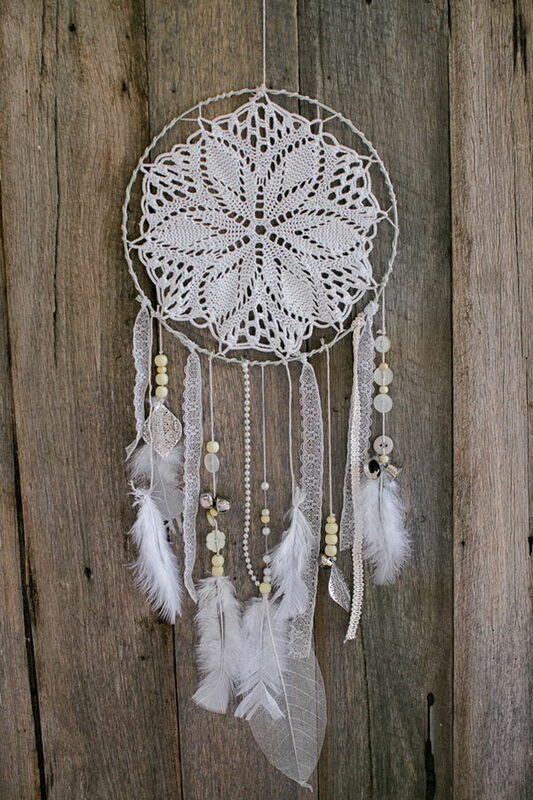 It was believed the dream catcher can filter out all bad dreams and spirits, let only the good dreams and positive thoughts enter our mind. Tutorial via hellomay. Lace is inherently romantic. Add some sweet DIY accents to your holiday decoration using these easy to make paper doily Christmas trees. Via twojediy. This is a very pretty and inexpensive way to make your party look more ‘fancy’. Get the tutorial via marthastewartweddings. Earrings are like little pieces of art. 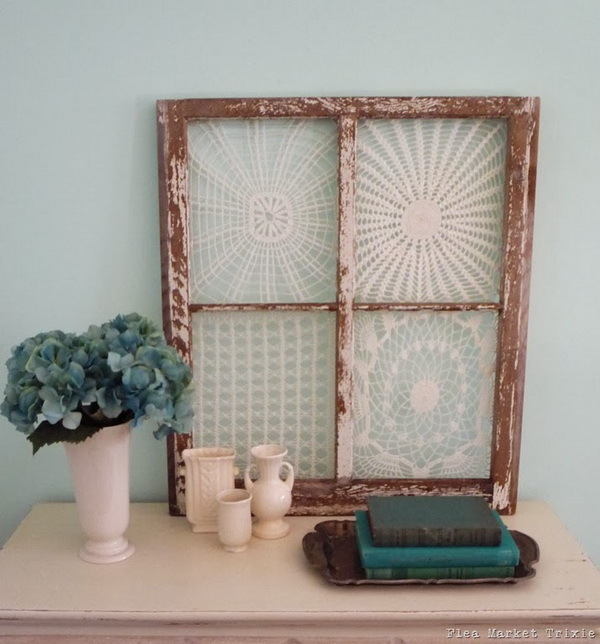 You can display them using a jewelry holder made from white lace doily and a frame. Easy and practical! Tutorial via bijoux-sucres. 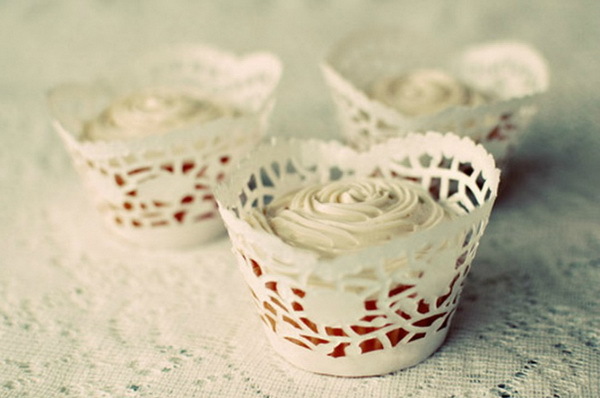 Love this lovely and vintage way to enjoy your favourite doilies. Get the tutorial via modernwedding. Get the tutorial via fleamarkettrixie. Get the tutorial via vanessachristenson. Get the tutorial via katrinshine. 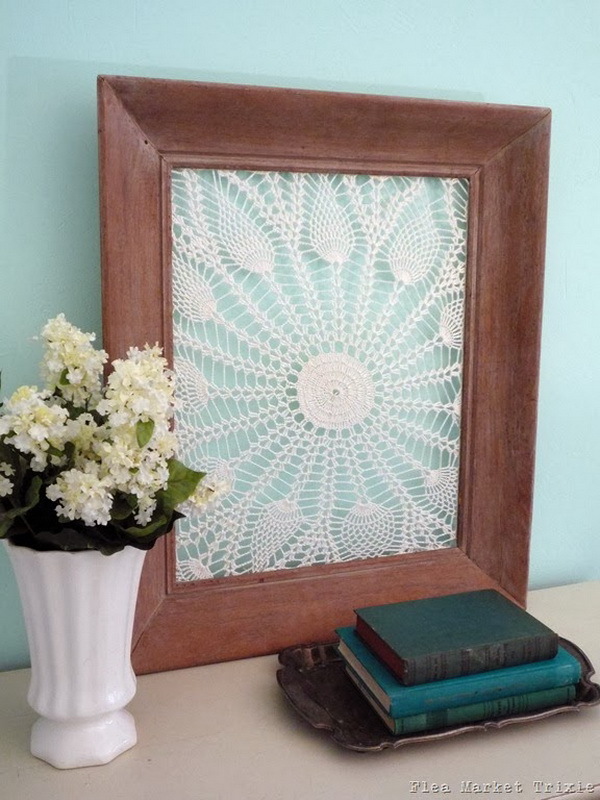 Use doilies and paint to make fancy doily canvas art for yoour home. Get the tutorial via hamblyscreenprints. Use 3 doilies, 3 pom-poms, 2 popsicle sticks, 2 wiggly eyes, cut out hat, scarf, mittens, mouth, nose from paper and felt to make this cute doily snoman. 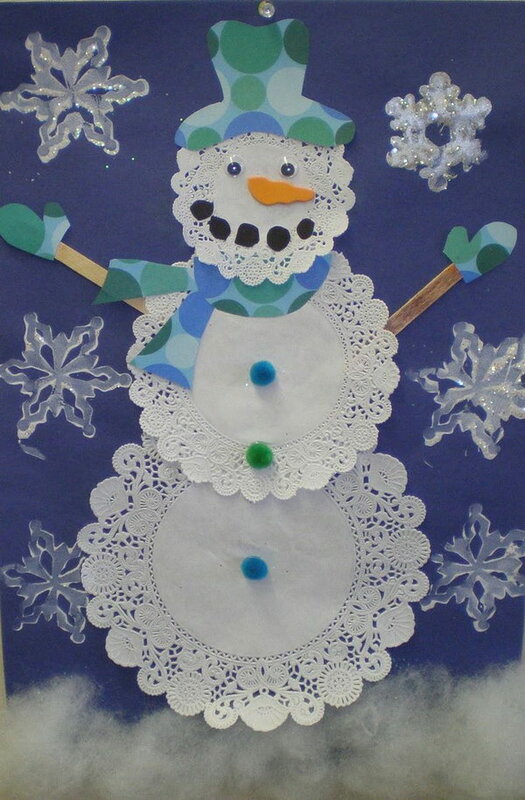 Also a cute paper doily snowman craft for kids. Get the tutorial via margauritaspear. 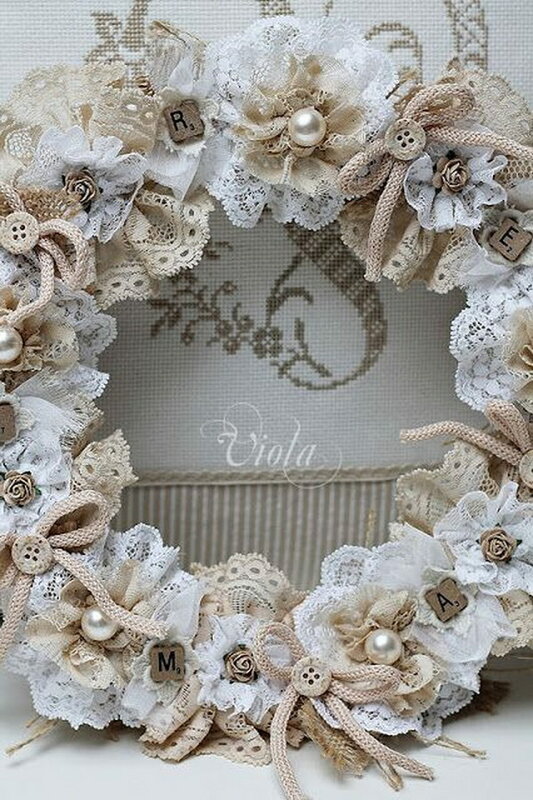 The paper doily wreath is so beautiful and easy to make. Get the tutorial via adiamondinthestuff. Start with hanging a blown up balloon from a string. 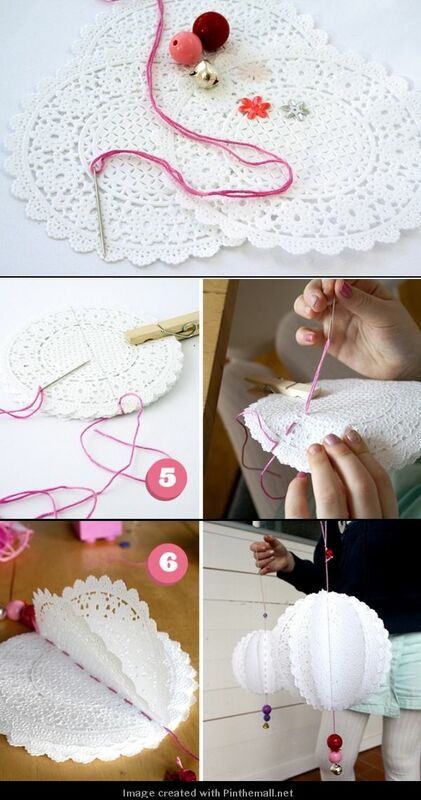 Dip lace doilies in wallpaper glue and wrap on the balloon. 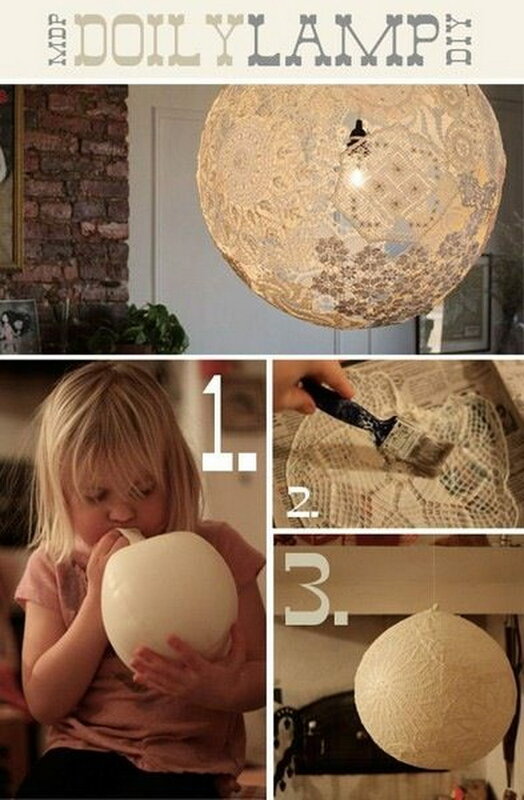 When they’re dried, pop the balloon with a pin and add a tea light candle. Get the tutorial via spirelloskrimskramserier. 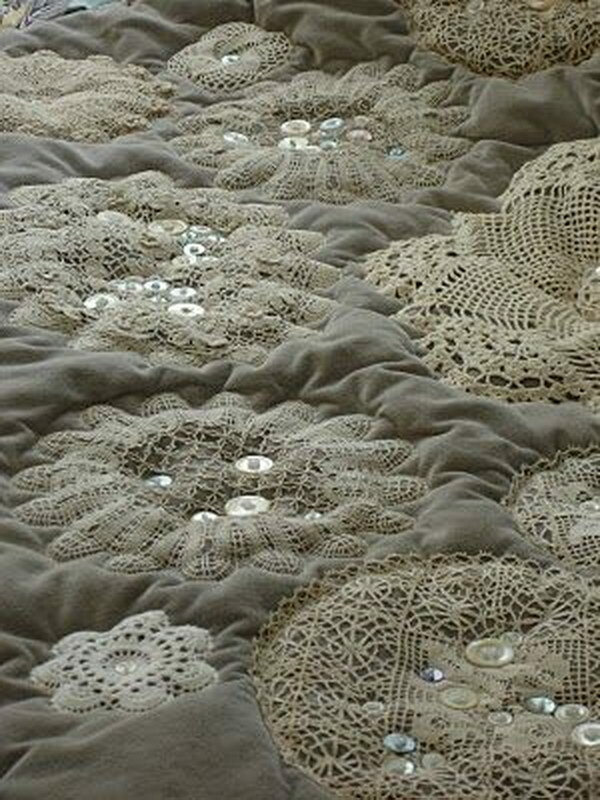 Great way to repurpose crochet doilies and buttons onto your quilts. Tutorial via lovelytextiles. Personalized gift bags idea for your guests. Tutorial via womansday. 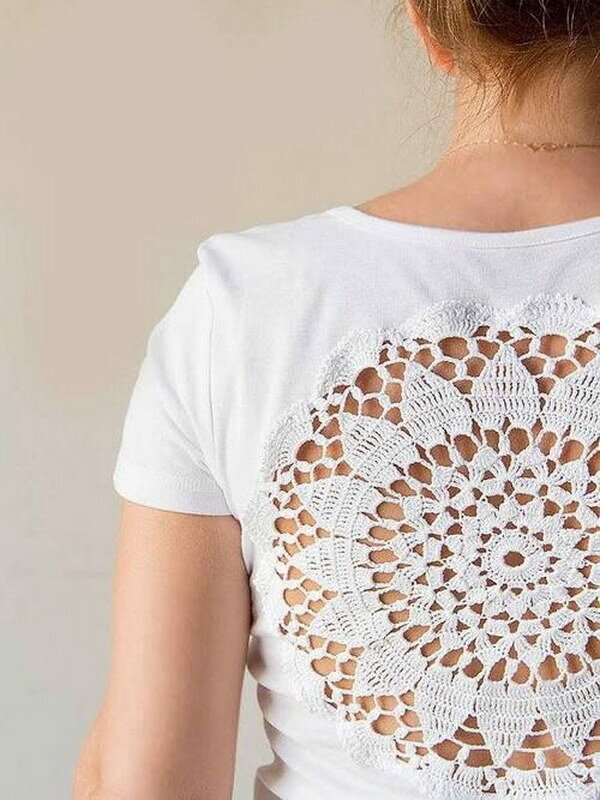 Cut a hole in the back of a tee shirt top and sew in a hand crochet doilie. Get the tutorial via youtube. 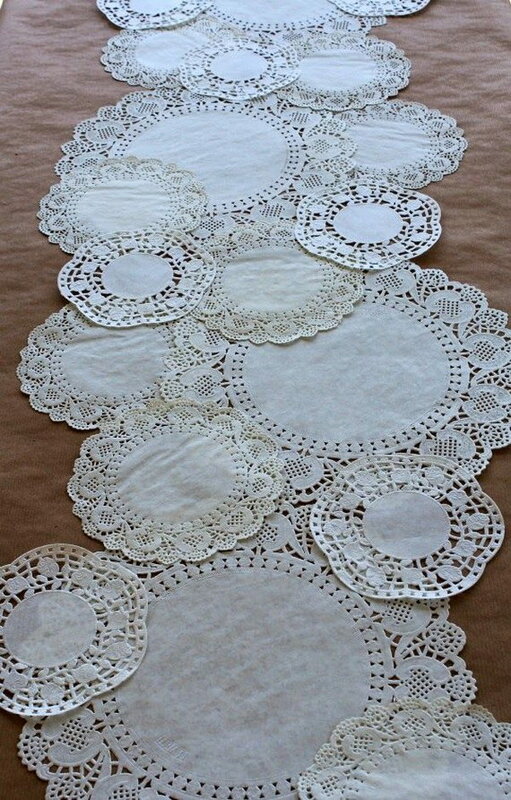 What beautiful idea to use paper doilies as a table runner. Perfect for a little girls party or for a bridal shower. Tutorial via lovethatparty. 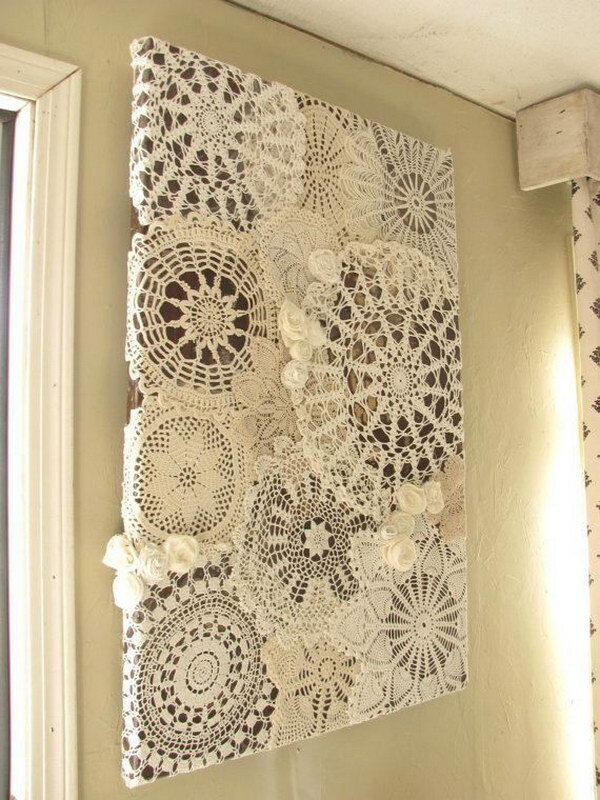 This is a great idea for displaying old doilies and using them as shabby chic home decor. 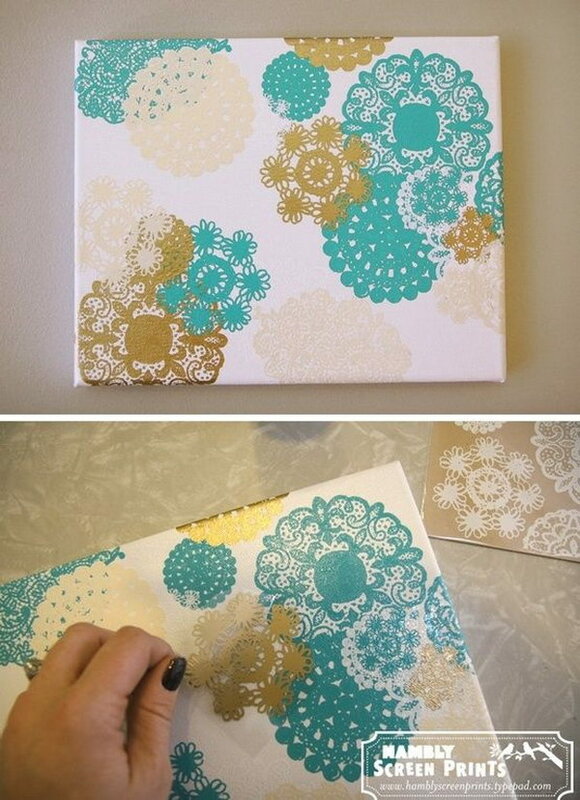 Sew all your doilies onto a painted canvas. Tutorial via facebook. 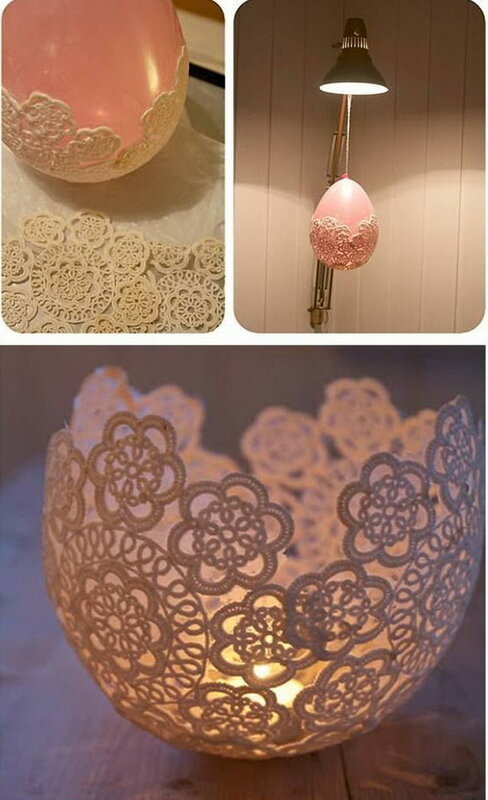 Paint doilies with wallpaper glue, then laid them on a balloon to dry. When the whole thing is hardened, pop the balloon with a pin and run hanging lamp hardware through the hole. Tutorial via dosfamily. Make a elegant polymer-clay lash bowl for jewelry dish. Get the tutotial via duitang. 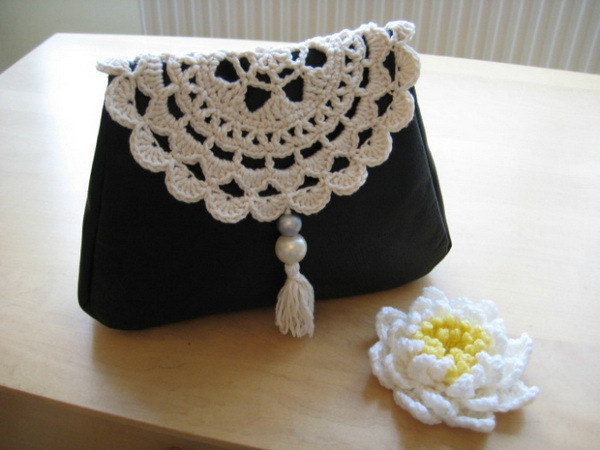 Use doily to make bags that are romantic and fancy. Perfect for wedding favors and baby shower gifts. Get the tutorial via source. Check out this tutorial on how to make cute paper doily ornaments for your next party. Tutorial via pysselbolaget. Get the tutorial via salttree. Get the tutorial via makemydaycreative. Get the tutorial via goodhousekeeping. Get the tutorial via beadandcord. Get the tutorial via intimateweddings. Get the tutorial via racheldenbow. These turned out really cute! Well done. Thanks for compiling and sharing this list! Definitely want to try a few of them!